A trimmer reel lawn mower is a very handy item. 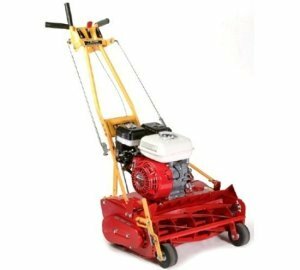 For those home owners who demand the ultimate appearance of their large lawns, only a reel lawn mower will do. Problem is, a large tow behind reel mower has a hard time getting close to shrubs and landscaping in the yard. Here is where this mower comes in. The cutting width is usually the same as a regular lawn mower - from 18” to 24”. Power propel is an option, but most mowers have the option of pushing and guiding the mower by hand while the reel is still engaged and cutting the grass. The results are nothing less than spectacular. A well manicured lawn that is perfectly trimmed. This is a thing of beauty! There are few manufactures of this product these days. Thankfully, the available models are all very well built and do a masterful job at cutting the grass. Below are links to the most popular mowers\ models readily available today.